In 2011 the Microsoft App Marketplace had about 25,000 apps, a tiny fraction of what their competitors boasted. Apps are the lifeblood of smartphones and tablets, but how do you grow an app store to support your own mobile devices when Apple and Google already dominate the market? You might think that a company like Microsoft would just throw money at the problem, but the software giant wanted innovation. 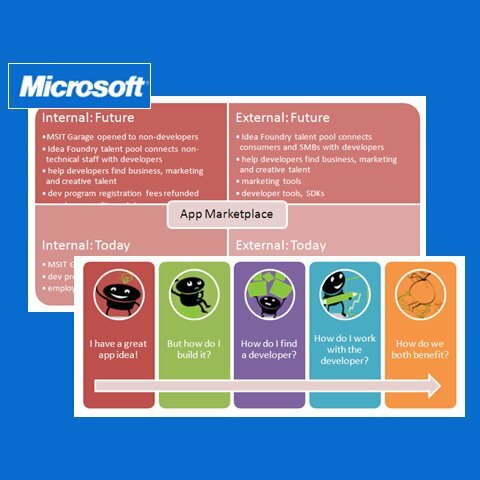 Microsoft engaged me to conduct an analysis of mobile app marketplace growth opportunities, in order to help them expand their app store in the wake of the Nokia move from Symbian to the Windows7/8 operating system. This was a big opportunity, and Microsoft needed more apps in order to grab market share. During the course of interviews with senior Microsoft staff and executives I conceived the Idea Foundry, an initiative that would connect mobile developers with business and marketing professionals, enabling them to team up on ideation, development, and promotion. Microsoft then engaged me to write the Idea Foundry Business Requirements Document and feasibility study.